Sometimes when you’re getting ready on those cold winter mornings all you want is a quick and easy outfit. Minnesota’s winter has been extra cold this year. That’s why I need to be prepared with winter staples. Nothing is better than a cozy, soft t-shirt! The Home T delivers when it comes to soft, quality shirts while showing off your state pride. Along with tops, The Home T also offers accessories, home, and decor items. There’s another big reason why we’re loving this company. The Home T donates 10% of their profits to multiple sclerosis research. We really appreciate companies that donate part of their profits like this. Plus, The Home T appeared on Shark Tank, which is one of our favorite shows! In today’s blog post we’re styling two of their classic t-shirts: the v-neck and crew neck. These t-shirts can be styled so many ways! We can’t wait for it to warm up again so we can wear our t-shirts with cropped pants or shorts. These t-shirts would look great with converses as well. Now let’s get into how we styled these them! I can’t believe how fast fall is going this year! It makes me a bit sad since it’s my favorite season and I’m not ready for winter to come at all. This fall I’ve been loving a top that screams fall when you see it. Since fall is going so quickly, I thought I better share it with you now before it’s too late and you’re onto winter clothes. Fyi, this top is another item I scored from Loft. Sorry if you’re getting sick of me talking about Loft, but they’ve just had so many cute clothes and major sales this season! If you didn’t know, I’m an elementary special education teacher. I absolutely love what I do and wouldn’t trade it for anything! I’m now back to work after a truly amazing summer and working on getting back into my routine for teaching. Last Thursday was our official first day of school with students. Even as a teacher I still get excited and nervous for the first. I also love to carefully pick out my first day of school outfit. I’m sharing that outfit with you in this post! If you’ve been reading our blog for awhile or following us on Instagram, then you know that Rachel and I love wearing Lilly Pulitzer during the warmer months. This summer I got some new Lilly Pulitzer pieces while I was in South Carolina. Shout out to The Pink Cabana in Myrtle Beach and the wonderful ladies that helped my sisters and I pick out all of our Lilly goodies! I’m excited to share this particular t-shirt dress with you because it’s perfect for summer and so versatile. It may be August, but we still have at least a month left of wearing Lilly Pulitzer, depending on the weather where you live. I just purchased this American Eagle utility shirt recently and have been very impatiently waiting to style it. One important detail about this shirt that I love is the fact that it’s so soft. It’s always refreshing to find a button up shirt that’s soft and not overly stiff. This shirt could really be worn all year round as well, which is an added bonus. I decided to style this shirt with cognac brown details because I really like the looks of this color combination. I decided my new Tory Burch cross-body purse would look perfect with this outfit. 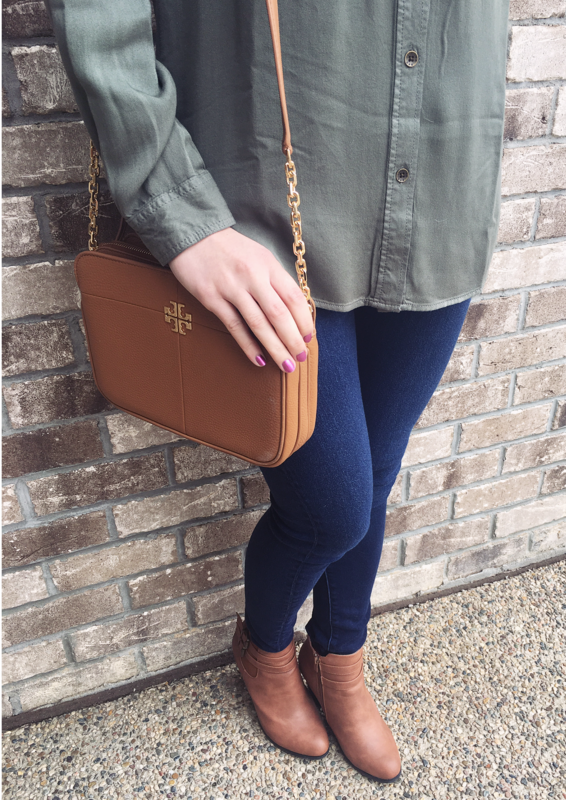 This is my first Tory Burch bag and I think it’s great for every day use. It’s also the perfect size to fit everything I need. I then finished off my look with these booties from Hope’s. I think dainty, gold layered necklaces would also be a great added touch with this outfit. As you may have seen from our social media, Rachel and I were in Las Vegas this past weekend. Coming from Minnesota’s cold winter, the weather in Vegas felt perfect to us. It was around 60 degrees while we were there. It was a short getaway, but so much fun! We saw Britney Spear’s show, went to the Neon Museum, saw a Titanic Exhibit, ate lots of good food, and a did a bit of shopping.